“I have always wondered why automatic writing has not been invoked more in the ever-multiplying number of discussions and positions taken on ‘composition vs. improvisation’.” Adam Linson, sleevenotes to integument, Lawrence Casserley/Adam Linson (psi 09.03, 2009). 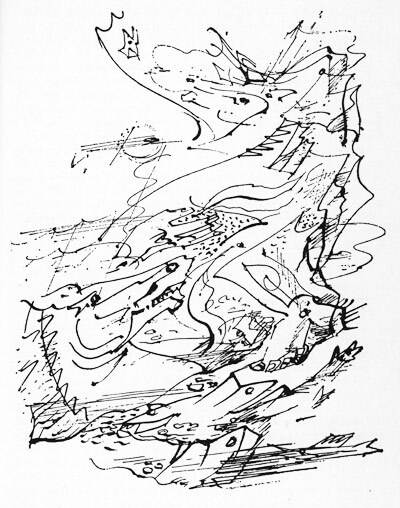 On Martinique, Breton came across another recently arrived refugee from France, André Masson, painter-explorer of automatism, chance and altered states. A discovery of the literary journal Tropiques, found while browsing in one of Fort-de-France’s shops, led Breton to a meeting with the poet of Negritude, Aimé Césaire. Solar Throat Slashed (Soleil cou coupé), Césaire’s incandescent collection of surrealist-automatist poems published in 1948 wrenched automatism, along with the streams-of-consciousness of Joyce, Woolf and Faulkner, away from their attachment to European and American psychology (Freud, Pierre Janet, William James) into the colonial realities of the tropics. While the limits of pure automatism became quickly apparent – Césair later made politically directed revisions and cuts to Solar Throat Slashed, while Masson’s work had shifted away from automatic drawing by the late 1920s – music seemed strangely indifferent to its potentialities. Perhaps this was because of its greater emphasis on group performance (in which automatism becomes a far more complex process); perhaps because the technical demands of musical instruments discouraged abandonment (the paradox identified by Lévi-Strauss). With a few exceptions, it was not until the 1960s that music begin to coax messages from what Breton, after the aural hallucinations that preceded his automatic writing collaboration of 1920 with Philippe Soupault, The Magnetic Fields) described as the mouth of shadows. This entry was posted in into the maelstrom, Uncategorized and tagged Adam Linson, Aime Cesaire, Andre Breton, Andre Masson, automatism, Claude Levi-Strauss, improvisation, James Joyce, Lawrence Casserley, stream of consciousness, The Magnetic Fields, Virginia Woolf, William Faulkner. Bookmark the permalink. Thanks Michael, encouragement duly noted and absorbed.